In this GISS image, incorrect data shows much of Russia under a heat wave in October. Scientists at NOAA and NASA’s Goddard Institute for Space Studies (GISS) announced last week that October global temperatures were the hottest on record. Naturally this caused quite a bit of hubbub and had the global warming alarmists in quite an uproar. As we wrote about previously, the year has been cooler than normal in North America but this new data showed that Asia experienced record high temperatures last month. Word of the “hottest October on record” quickly spread of course. In a bit of an embarrassment for NOAA and GISS, their claims were short lived when two blogger meteorologists went through the data and found a number of anomalies. They discovered at least 10 Russian stations that oddly enough reported the exact same temperatures as September. Well, since October is almost always cooler than September in the northern hemisphere they did some checking and found that GISS had used the incorrect data and it influenced the calculations significantly. Al Gore's infamous "hockey stick" graph that was used in An Inconvenient Truth was quickly debunked as were a number of other "facts" used in the movie. This isn’t the first time “anomalies” with data used to measure the earth’s temperature have been discovered and have caused incorrect calculations. In other curious happenings, measuring stations have “disappeared” from data only to reappear later, stations have been found to be sitting next to heaters and gas wells and more. 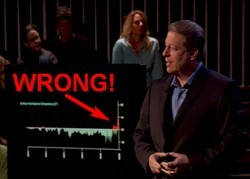 Then of course there was Al Gore’s infamous “hockey stick” graph which was debunked soon after he began showing it. Perhaps in the most grievous error just last year, NOAA had to revise their published figures for U.S. surface temperatures, to show that the hottest decade of the 20th century was not the 1990s, as they had claimed, but the 1930s. When GISS and NOAA recalculated October’s temperatures it dropped the month to the 2nd warmest on record and that is significant. However, these types of problems serve only to fuel doubt in the minds of climate change skeptics and highlight the need for more careful analysis and a level-headed approach to studying the subject – from both sides of the discussion. This entry was posted on Wednesday, November 19th, 2008 at 6:56pm MDT and is filed under Climate Change. You can follow any responses to this entry through the RSS 2.0 feed. You can skip to the end and leave a response. Pinging is currently not allowed. Oh how I wish Al Bore would just go away. I think that anyone looking at things objectively really has to wonder just how true all of this man made climate change stuff is. The data does seem to show changes in our climate but the big question is just how much we are responsible for and how much is natural. The writing is on the wall and the research is solid. Man made climate change is real and anyone who doesn’t think so has their head stuck in the sand. Typical alarmist tactics: bald assertions – “research is solid” (ie: The Science Is Settled), doubters are dumb (or more politely, have their heads in the sand); zero facts or figures. Come back when you have some; in the meantime, you might want to visit Climateaudit.org. That is, if you’re willing to get your hands dirty on some raw data, and aren’t afraid of some real statistics.